I have been wanting a bagel egg and cheese sandwich like crazy. Thankfully with this easy Keto Bagel recipe I can and stay on track like I want to! 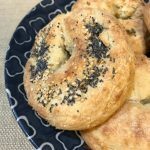 These low carb bagels made with almond flour and mozzarella cheese are the perfect solution to me wanting a bagel! These low carb bagels make a great keto friendly breakfast. You can enjoy them toasted with cream cheese, or my favorite way… topped with a fried egg and cheese! 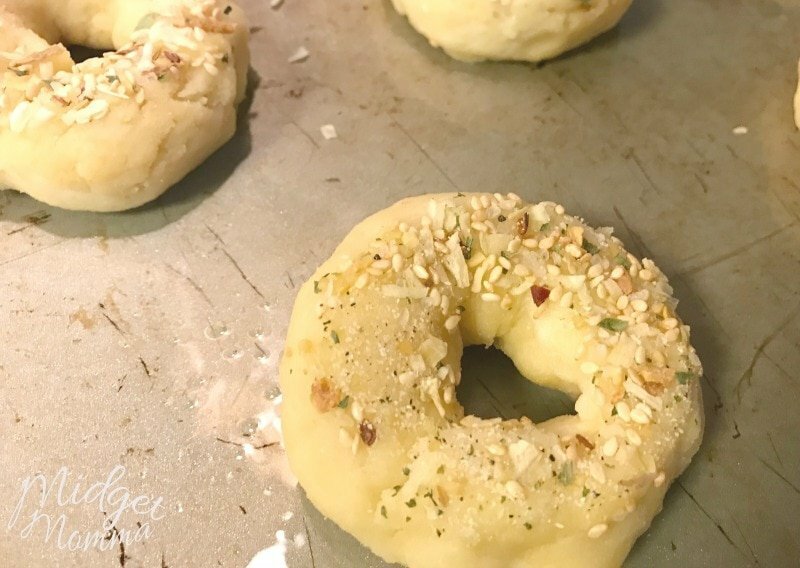 This Keto Bagel Recipe is simple to make using almond flour, mozzarella cheese and a few other ingredients. Don’t worry, you can’t even tell that you are using mozzarella cheese in them when they are all finished. I will warn you though, they are not going to be the New York style bagel, the texture is different, not bad but different. I am not phased by the difference at all, but as someone who knows what a good NYC or New Jersey fresh baked bagel tastes like I felt the need to let you know in advanced they are different. How Long does it take to Make Keto Bagels? This Keto Bagel recipe will take you about 25 minutes from start to finish to make. I have recently been making an extra batch because the kids seem to enjoy them more then the bagels I buy them from the store and have been eating mine. I may just stop buying bagels all together at this point. When picking toppings for our low carb and keto friendly bagels, I kinda just wing it every time. It depends on what I am in the mood for. Sometimes we end up with salted, sometimes garlic, sometimes poppyseed. Sometimes we end up with a total mix of whatever on the top of them. I will admit that I am totally lazy when it comes to shaping mine. I am totally ok with uneven, not perfectly circle bagels. You can mess with the dough when forming these low carb bagels to be perfect circles but I don’t mind mine being misshapen so I don’t worry about it. Need the best way to cut any bagel? This bagel cutter I can NOT live with out! It was one of the first things I bought when Tom and I got married and I refuse to use anything else to cut my bagels in half! 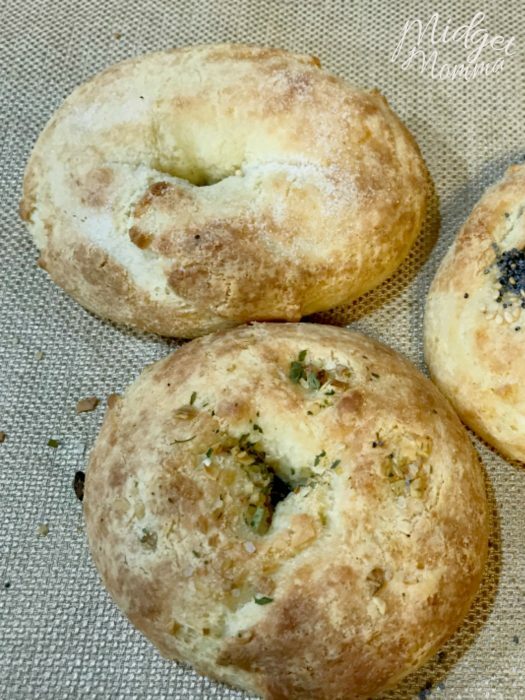 You only need 5 ingredients to make these easy low carb bagels. 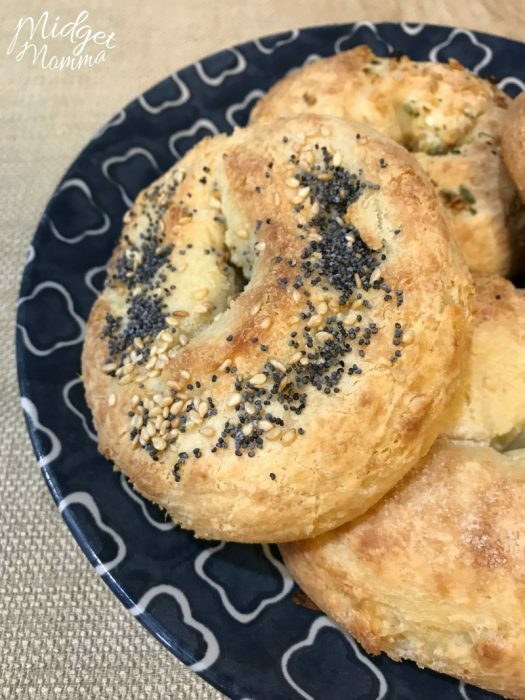 These are keto friendly bagels made with mozzarella cheese, cream cheese, almond flour, egg and baking powder plus the toppings of your choice. 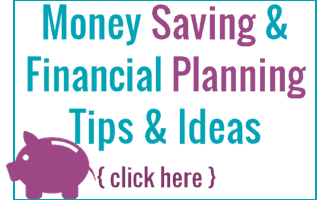 Place the mozzarella cheese and cream cheese in a microwave safe bowl. Microwave for 1 minute, stir to check how blended it is. Then microwave for 25 seconds to 1 minute more. Mix well again when removing from the microwave. Add the egg into the mixture and mix well until the egg is totally mixed into the cheese mixture. Add cheese and egg mixture to your food processor and add in the dry ingredients and process until a dough forms. Scrape the dough back into the bowl you melted the cheese in and let sit for 2-3 minutes. Just so the dough cools a little bit. Spray a baking sheet with nonstick spray - I prefer to use olive oil spray. Once the dough is a little bit cool, split into 5 even balls of dough. Using your hands roll each piece into a snake shape, then fold to form the "bagel shape". Pinch the dough together at the ends so they stay together. For the toppings of your choice you can either sprinkle them on top or pour them on to a small plate and dip the one side of your bagel into them. If you do not want to have toppings you can skip that as well. Once bagels are formed and have your desired toppings, place on your baking sheet(topping side up). Bake for 12 minutes or until the outside has browned. Let cool for about 5 minutes, as they will be soft when you take them out of the oven. Enjoy right away or store in an air tight container in the fridge for about a week. These Keto bagels have a net carb of 11g. Looking for more Keto? Check these out! Make sure you also check out this Keto Shopping list for Aldi! It will totally make your shopping for Keto items so much easier! Ummm, don’t want to be annoying…..but I think you posted the nutrition info for the whole recipe, not per serving! You’d need to divide each number by five to get the true serving info. There’s NO WAY each bagel is 11 net carbs! It should be about 2 grams of net carbs per serving, I believe.